Easy2PC provide Network Cabling design and installation Services across Northants. Network Cabling provides a foundation to which the overall network is built upon. Strategic planning ahead of time can save you a lot of headaches in the future with regards to moving, changing, rearranging, and upgrading. The Network Infrastructure in your office or building will most likely outlast your entire network and when done right can support multiple systems, such as voice, data, video, and multimedia. Easy2pc can assess your cabling needs and devise a plan for installing a cabling solution that can grow with you. 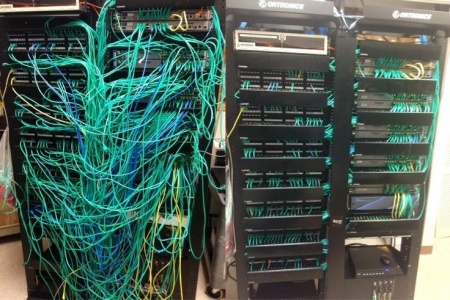 Are your servers stuck in a corner somewhere, an eyesore for anyone that happens to walk by? Easy2pc can straighten out the wiring and nest of cables that are currently found in your "server room" and generate a more physically secure environment for all of your infrastructure hardware. Physical security is one of the most often overlooked risks in a company's network. Easy2pc has the experience and knowledge to design an aesthetically pleasing layout while still providing the required accessibility needed for your environment.